I do not see the Canadian release here... TNSD 0120. I have this on vinyl, promo copy . But I dont see this release ..
An absolute delight to listen to, whether in parts or in whole! Interesting rhythms swirl throughout the album, accompanied by samples both ethereal and grounded (hear the fantastic kettle drums, vocal stutters, and operatic cries in "Yayli" for starters); this whole album sounds like distilled, unrestrained joy. 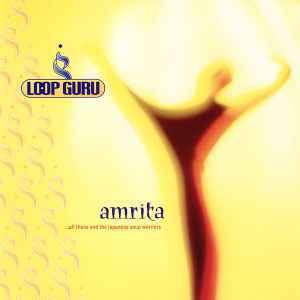 Other Loop Guru albums suffered from a sense of slow-developing melancholy sometimes, but _Amrita_ shows them at their best: mixing world music samples with danceable beats, a marriage sure to move your feet and make you smile. The liner notes collect some cultural reference points for the like minded to follow, and the credits reveal authors with mischief on their minds (always a good thing).